The Archaeological Survey of India (ASI), under the Ministry of Culture, is the premier organization.. 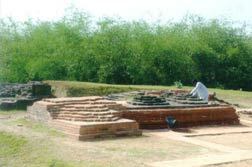 This is a mound locally known as 'Ballaldhipi'. During 1982 to 1988, Kolkata Circle excavated the Mound and exposed huge brick structures and various antiquities datable to c. 10th to 12th cent. AD. The brick structure include shrines on sides and a massive construction within an enclosure. Amongst the antiquities stucco heads possibly of Buddhist affiliation and copper objects used in religious purpose are noteworthy. 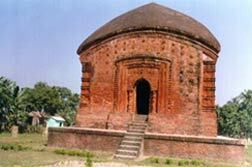 A brick-built Char Chala Temple with exquisite terracotta ornamentation. The ornamentation includes floral and geometric motifs, events of the Ramayana etc. c.17th century AD.